With the dream of sending humans to Mars closer than ever before, Horizon asks the world's leading experts on Mars where they would go and what they would need to survive. The dream of sending humans to Mars is closer than ever before. In fact, many scientists think that the first person to set foot on the Red Planet is alive today. But where should the first explorers visit when they get there? Horizon has gathered the world's leading experts on Mars and asked them where they would go if they got the chance - and what would they need to survive? 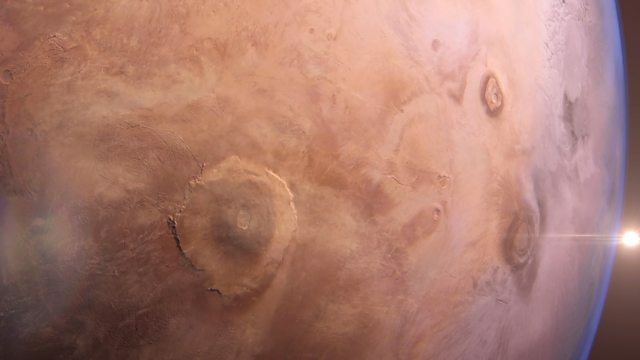 Using incredible real images and data, Horizon brings these Martian landmarks to life - from vast plains to towering volcanoes, from deep valleys to hidden underground caverns. This film also shows where to land, where to live and even where to hunt for traces of extraterrestrial life. This is the ultimate traveller's guide to Mars. Programmes about space travel, life in our Universe, the Solar System and more.